Southern senior running back Trey McNickle (5) follows blockers during a first half run in a Week 9 TVC Hocking football contest against Trimble at Roger Lee Adams Memorial Field in Racine, Ohio. 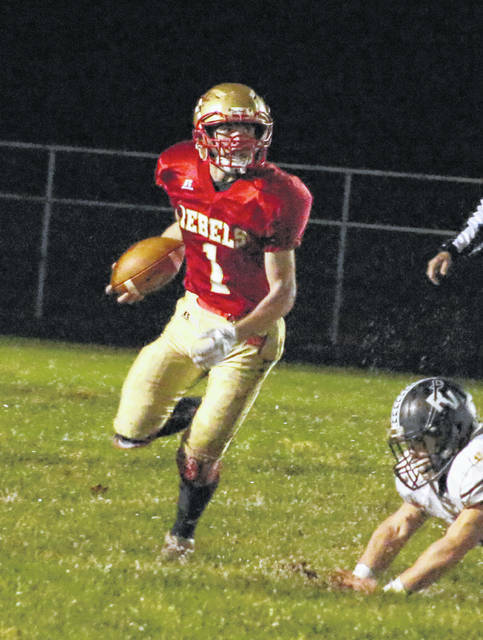 South Gallia junior Kyle Northup (1) breaks away from a River Valley defender during a Week 10 football contest in Mercerville, Ohio. Eastern and Southern each came away with four selections, while South Gallia garnered three spots on the 2018 Ohio Prep Sports Writers Association Southeastern Ohio All-District football team for Division VII — as voted on by numerous media outlets within the southest district. The Eagles placed fourth in Tri-Valley Conference Hocking Division play with a 4-4 mark and ended the year with a 5-5 record. Senior Blaise Facemyer was a first team defensive selection at linebacker, while sophomore Blake Newland was a first team offensive choice as an all-purpose player. Sophomores Steve Fitzgerald and Will Oldaker were also named to the special mention team on behalf of the Eagles. Facemyer recorded 101 tackles and two interceptions, while Newland had 695 rushing yards, 137 receiving yards and 186 return yards. The Tornadoes finished fifth in TVC Hocking play with a 4-4 record and ended the season with a 6-4 overall mark. Senior Logan Drummer and junior Trey McNickle were both first team offensive selections at quarterback and running back, respectively. Seniors Austin Arnold and Auston Colburn were also named to the special mention team on behalf of the Tornadoes. Drummer completed 100-of-150 passes for 1,527 yards and 27 touchdowns to go along with four interceptions. McNickle posted 1,012 rushing yards and 12 touchdowns on 105 carries. The Rebels placed sixth in TVC Hocking play with a 3-5 mark and went 3-7 overall this fall. Junior Kyle Northup was a first team offensive selection as an all-purpose player. Junior Justin Butler and senior Garrett Saunders were special mention selections on behalf of the Rebels. Northup rushed for 1,146 yards and had 347 receiving yards for South Gallia. 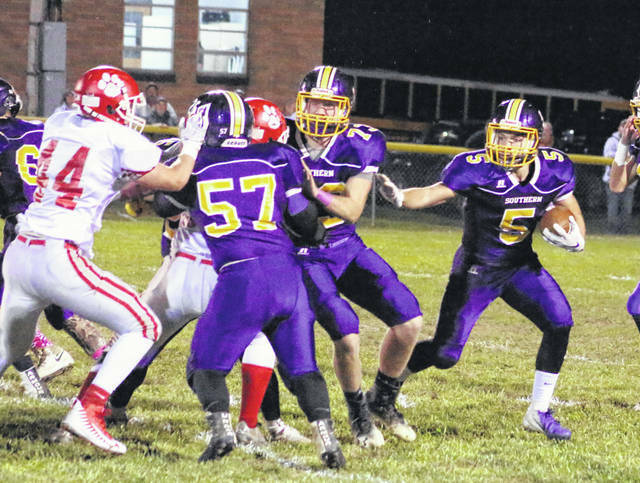 Connor Wright of Trimble was named the D-7 Offensive Player of the Year, while Sawyer Koons of Trimble was the Defensive Player of the Year. The D-7 Coach of the Year honors were shared between Phil Faires of Trimble and Ted Newsome of Green. Ends: Zane Heiss, Waterford, 5-10, 175, Jr.
Linemen: Chad Morris, Willow Wood Symmes Valley, 5-10, 240, Sr.; Alex Coffman, Glouster Trimble, 5-10, 200, Sr.; Colin Jackson, Waterford, 5-9, 240, Sr.
Quarterbacks: Logan Drummer, Racine Southern, 5-10, 140, Sr.; Cameron Kittle, Glouster Trimble, 5-11, 165, Jr.
Running backs: Alec Smith, Franklin Furnace Green, 5-9, 180, Jr.; Trey McNickle, Racine Southern, 5-10, 170, Jr.; Blayton Cox, Corning Miller, 5-6, 155, So. ; Conner Wright, Glouster Trimble, 5-10, 185, Jr.; Max Hooper, Glouster Trimble, 6-0, 195, Sr.; Braden Bellville, Waterford, 6-0, 205, Sr.
All-Purpose: Jack Leith, Willow Wood Symmes Valley, 6-3, 170, Jr.; Blake Newland, Reedsville Eastern, 5-6, 152, So. ; Kyle Northup, Crown City South Gallia, 5-11, 155, Jr.
Linemen: Caleb Derifield, Franklin Furnace Green, 6-1, 180, Jr.; Ian Joyce, Glouster Trimble, 6-2, 205, Jr.; Peyten Stephens, Waterford, 6-3, 215, Sr.
Linebackers: Lonnie Smith, Franklin Furnace Green, 6-3, 190, So. ; Blaise Facemyer, Reedsville Eastern, 5-8, 180, Sr.; Sawyer Koons, Glouster Trimble, 5-11, 210, Jr. Defensive backs: Keifer Wilson, Willow Wood Symmes Valley, 5-11, 160, Sr.; George Pantelidis, Waterford, 6-1, 155, Sr. Offensive Player of the Year: Conner Wright, Glouster Trimble. Defensive Player of the Year: Sawyer Koons, Glouster Trimble. Co-Coaches of the Year: Phil Faires (Glouster Trimble) and Ted Newsome (Franklin Furnace Green). Mason Hensley, Franklin Furnace Green; Seth Imes, Franklin Furnace Green; Logan Emnett, Portsmouth Notre Dame; Braidan Haney, Portsmouth Notre Dame; Chandler Carver, Sciotoville Community East; Steve Fitzgerald, Reedsville Eastern; Will Oldaker, Reedsville Eastern; Austin Arnold, Racine Southern; Auston Colburn, Racine Southern; Justin Butler, Crown City South Gallia; Garrett Saunders, Crown City South Gallia; Sam Ives, Glouster Trimble; Shawn Turley, Glouster Trimble; Brock Hayes, Waterford; Jacob Calvert, Manchester.